Elyse, you have the sweetest son. I wanted to say that before anything. I love that he wanted to see how you were feeling. But such timing! I totally hear you and I have this dilemma too–and get especially frustrated when the kids are home for the summer and I’m never sure when I can squeeze in my writing time. I’ve made sure to be really clear with my husband that if I don’t have a solid block of time in the schedule, I’ll steal it from family time and inopportune moments out of desperation. So I do head to Barnes & Noble or Starbucks to get my uninterrupted time. The white noise doesn’t bother me. I get in the zone and scribble away. That is, if the writing flows on command. Last week, I was on a subway when the ideas kept coming. By the time I sat down to write them out, they were not the same. However, staying at home would be an invitation for disruptions. Yes, I hear you. My favorite place to write is on my laptop on my bed. With quiet. I have been known to do Starbucks with headphones or Barnes and Noble on a floor. A library is actually too loud, if you can believe it. As for today with my son? I stopped what I was doing and he and I simply hung out for the next 3 hours. Now he’s on the computer and I’ve been given another “reprieve” to write – door again shut – let’s see how long that lasts! LOL! I hear your frustration, Elyse, but be glad that you have a family and son to love your company enough to interrupt you. Perhaps you’ve hit on a solution by not writing at home, but I do think our words escape us sometimes forever if they’re not written down at the moment of thought. You’re right and I am so thankful they are in my life. I think I am just one of those people that also selfishly needs a little me time to be sane. But you’re right – find other times to write, like now it’s nearly 11:00 pm and I’m checking emails and going to write now when everyone else is asleep. So I don’t sleep! LOL! It’s tough when they’re little, or if you’ve got ADD kids/adults in the house who have low impulse control and don’t really even realize that they have interrupted you again until after the fact. I sneak time writing in the car (hubby driving), but if people in the car are chatty instead of just listening to their radio/music, then I have to recognize that it is time to simply close the laptop and be present for them, rather than getting frustrated and angry trying to continue writing. I discovered one strategy quite by mistake doing the pomodoro technique. Pomodoro is similar to writing sprints. You write for a specified length of time, and when your timer goes, stop mid-word or mid-sentence and take a specified length of time for break, then go back to the next writing interval. After three or four writing intervals, you take a longer break. While testing out this method, I found unexpected benefits with my usual interruptors. I would do a writing interval of twenty or twenty-five minutes, followed by a five minute break. When someone would walk into the room, call me for help, etc., I could look at my timer and say “give me six and a half minutes”. A very specific, measurable length of time seemed to soothe their souls. They knew that they weren’t just being put off, but that I actually would stop when my timer said to stop, and they knew how long they had to wait. After doing this for some time, they started to show a new behaviour—knowing that I was doing pomodoro and would only be writing for twenty-five minutes, they actually waited until the next break. Okay, sometimes they came in and started to talk to me and then said they would wait until the next break when they remembered, but this was definitely progress! You will also get better at resuming after an interruption as you continue to work at it. One strategy is to quickly jot a few words before looking up from your screen when you realize you are being interrupted. A quick //Kelsey walks in next or //how could you… or some other quick shorthand for what was coming next can be a lifesaver. You mention that you are distracted when someone comes in to get something or use the bathroom. You may be able to avoid being so distracted if you are using headphones, or if you can find a place to work where there is nothing (or is less) that the family needs to come into the room for. Or maybe there is a way to screen you from the rest of the room. Sometimes my only non-interupted time is in the early morning before anyone else is up. There is a balance to be struck. I am able to write far more now that my kiddo is not so little and does not need constant attention. We do still have to find time for homeschool, crises, and spontaneous displays of affection. And there are still time when I know I need to put aside my writing, even though I have not reached my word goal, and spend time with a family member who just unaccountably needs more attention. Sometimes half an hour or an hour of full attention, a wrestle on the bed, a story, talk, or a snack together will give you more productive time later than trying to deal with half a dozen interruptions while getting more and more frustrated with your writing and your family. At the end of the day, week, or month, which are you going to regret more; being short on words or late on a deadline, or that you have been snarly with your family and someone went to bed in tears? I’m certainly not perfect and neither is my family. And yes, I have on a couple of occasions been known to get up, grab my laptop and my bag, and leave the house in order to be able to complete a job when the home environment simply wouldn’t let me (and I was not committing any neglect by doing so!) It’s a balancing act, and balancing is never easy. In defense of the interrupters: Authors make what they do look easy. We see you sitting at a desk, chair etc with a dreamy look and take for granted you are creating effortlessly. I once suggested Rebekah write a novella or two while she was working on Jessie, which took two years. I needed new material to promote and it was only a novella. Yep, didn’t go down well. Maybe the solution is to tease out your hair, smudge some eye liner under your eyes and look drained or tormented. You have to make it LOOK as hard as it really is. LOL, I look like that ALL the time anyway Onisha! Not sure if that will work! First, I gotta have that shirt – where can I get one? Secondly, interruptions are a part of life and I’ve learned to accept them and well, I’m going to let you in on a secret. I’m retired, my kids are out of the nest and I only have my wife. You won’t believe the interruptions and it’s not just her!! In fact, she’s a Saint – she actually ignores me. The phone, email, the internet, something flies by the window (sure, it was a bird – ah, but what kind? Was it the Baltimore Oriole? Or perhaps the eagle, again?) Oh, wait, a bunny is hopping around outside or a doe and fawn just ambled in to graze. See, interruptions are never “gone” – there is always something. Did I mention pee breaks? Or the need for water? Or a cookie? About the only time my wife bothers me is for a meal or if we have to go somewhere. Like I said, a Saint. Right now you have family and other things to interrupt your writing. In another 20 years, it will be several other issues to interrupt your writing. I understand the “zone” zen of writing but I’ll tell you this – that zone is only available for a limited time. Enjoy it while you have it – be it 30 mins or 5 mins. Maybe interruptions are Nature’s way of letting you know, what you thought was good, just ain’t. I know, I know… I think it’s more of the time management – you say you’ll be gone for one hour – well, be gone for one hour. Once you’re back I know it’s my time to get off. But if you’re early, it throws me off. I am so glad someone has finally blogged about this topic. Interruptions drive me potty. Its like my family have an invisible siren in their heads which goes off the minute I start to type. Its hard for all of us mothers but made easier with thoughtful children. The only place in my house I could write was in my bed. If I got up I was fair game. I’m retired and until a year ago, my household consisted of my husband and I, our daughter and my mother, and two cats. If I stayed in bed, most of the time everyone but the cats would leave me alone until I came down. Now I am working on the sequel, my daughter has moved out, but she is a new mother and her calls to me are much more frequent and urgent now…I’m needed again. So what is a grandmother to do? The writing is put aside for now (although the characters are beginning to nag me to get back to it, they’re tired of being stuck under a waterfall) until my grandson lets his mother sleep a little more at night. It is a dilemma, however, the pomodoro method looks it has definite possibilities! So it doesn’t get better when they grow up! LOLOL! You know, I guess we just have to squeeze it in when we can, or never sleep. Thanks for commenting – really appreciate it. The “zone” concept is so real. It’s amazing how wonderful the sentences are that I never got to write down. Sure, let’s blame the interruptions for that. I have NO idea why it’s so hard to understand either! LOL – thanks so much for reading and commenting. LOL – Arnie is good – glad to meet you! I wasn’t able to write when my children were little but mostly because I was a single mom and there was nobody to take them out of the house for me. I totally understand how frustrating interruptions can be. Now that they’re all grown I have lots of time to write but I miss my babies. Enjoy every moment, even the frustrating ones! I totally get what you’re saying! I growl, sigh really loud, and pout. Doesn’t seem to work. I love the days when my husband has a handyman job and I get hours alone. He always has to remind me to fix him some lunch with a growl, a sigh, and a pout. Is there a lock on your door? Then lock it, and use earplugs to play your favorite music or white noise so you can ignore the inevitable knocking. Train them! They have you trained, alas. I use the “closed door” method too, but I’m not dealing with kids—just my dog and my husband. Oh wait—that is just like kids, isn’t it? While I love the lock the door idea – they’ll just bang on it thinking I can’t hear them! I have not trained them nearly well enough. Sigh. I had a two year old who would rip doors off their hinges or smash them through the frames if he was locked out. Needless to say, we stopped locking or even shutting doors to save on repair bills! You might have to resort to evil monster posters on your door that bar entry. I have the same need to be free of interruptions when I write. When I first got serious about writing, my wife took a part-time job purely to give me time alone. We were living on our boat, so there wasn’t much private space, and we were accustomed to always talking to one another. After the first book was finished, the pattern was broken. Now we share small spaces without interruptions being a problem. If I’m at the computer, she won’t initiate conversation unless something’s wrong, but it’s taken years of conscious effort by both of us to reach this point. At first, I was guilty of inviting her comments by body language or muttering to myself without realizing it. I’m much more conscious now about how my behavior might invite interruption. Well, you KNOW what I used to do with my son (white paper in front of computer screen, and only if it was absolutely necessary). But I wasn’t writing books or blog posts back then. 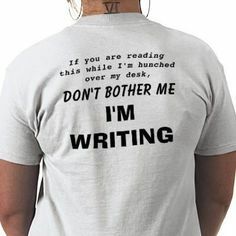 And thankfully (or not… the grass is always greener), I am one of those people who can zone everything and everyone out (really not even hearing them) when I’m engrossed and writing. Half the time I am saying “Gazuntite!” (not sure of spelling??) five minutes after my beau has sneezed. LOL!!! And not really knowing your situation or how things work in your family, I’m remiss at being able to help you. I mean, can you lock the door? I have a friend whose hubby bought her a red/green On Air or Off Air light to go outside of the closet where she does her voice over work. When the On Air light is on, he may NOT disturb her. This is her livelihood, so he knows there will be hell to pay. LOL!!! Maybe something like that, or maybe a good old fashioned timer that you set in your room, and if it goes off, they can come in? ??? Sorry I can’t be of more help!! Well, since I make so little at this, no one considers it livelihood and more of an expensive hobby, so that respect is not quite there yet. I think that’s the issue. But I totally know what you mean about saying God Bless you after someone sneezes and it’s a full minute later. I do that all the time – so I’m sort of zoning, but not quite! LOL! Definitely resonate here – distractions can be annoying. One great thing about living on your own. 🙂 Great post. Nothing a good beating can’t fix. But seriously??? How do you misunderstand no interruptions kids!!!!?? I have he same problem. Since we moved here my writing room is on the same level as the rest of the house, so it’s easier for my husband to interrupt than it was when I was upstairs in our other house. Of course, now I don t have to run downstairs everytime I hear my husband trying to ask me something that I can’t understand around a corner, one floor up. My husband is retired. When we lived in the other house he was usually out the door to the gym for 2-3 hours a day in the afternoon, I’d get lunch ready, and then I’d disappear back upstairs after lunch. Now he watches TV in the family room until noon and manages to interrupt my writing because he needs help finding something, or wants to tell me he needs me to do something for him. If I walk to the kitchen to refill my water glass, he stops me to tell me the latest international developments when I’m only wanting to get back to my computer. I love him dearly, but when he says he’s going to the gym and the other house to work, i expect him to be gone for hours. Sometimes he does come home unexpectedly in an hour or two because he forgot something and came back after a local errand. Then he reads the paper for an hour or two and I can’t really relax and get back in gear until he leaves again. I keep telling myself I will always have writing, but I may not always have him, and that helps me get things back into perspective. Wow, I totally feel your pain and I think you have a fantastic attitude. I realize I must leave the house if I want to be assured of getting time to write. Of course, I can’t control screaming children next to me in a restaurant, but at least it’s not my family. 🙂 Thank you so much for commenting.